Victoria Harbour views, a standout wine cellar and innovative French cuisine atop the Mandarin Oriental, Hong Kong. : French chef Pierre Gagnaire formally helms this Hong Kong restaurant in which the kitchen is under the daily command of capable chef de cuisine Nicolas Boujéma, who trained in establishments such as Gagnaire's Le Balzac in Paris. 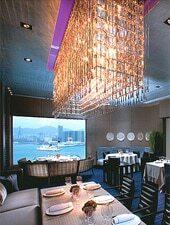 Victoria Harbour views from floor-to-ceiling windows on the 25th floor are as jaw-dropping as the dishes, while the intimate dining room is illuminated by ambient lighting from hand-crafted crystal chandeliers. Pierre boasts a walk-in wine cellar of more than 700 wine labels from premium vineyards of France, Italy, the U.S. and Australia. The menu changes seasonally and ingredients are mostly sourced from chef Gagnaire's network of small producers across France. Bread can be hit and miss in Hong Kong but not here, the long skinny flutes conjuring memories of the finest French baguettes. Entrées mix traditional with creative, like French oysters in a light banana mousse, dill/vodka/lime granité-poached langoustines, or foie gras soup with raspberry gelée bites. Mains, too, cross the gamut, from contemporary riffs on the classics, like the very thinly sliced filet of sole with apples, walnuts and warm sea almonds, to innovations like the lamb shoulder slathered in tamarind sauce served with eggplant flavored with lamb sweetbreads. Anyone who is still attempting to eat sensibly may wish to close with the fresh fruit salad of the day; however, for everyone else, at least one of Gagnaire's sweet treats is a must, like the Paris-Brest, a flaky pastry filled with cream and pralines plus caramelized hazelnuts, served with Calvados ice cream and grapefruit marmalade.